No crafts…fine arts geared to the young. Structured for the young artist yearning to create. Learning to “see” through basic drawing and sculpture going through the serious fun of exploring art by doing. Learning the value of concentration and enjoying the status of their developing skills, young students feel the excitement of achievement. Students are taught on an individual basis as teachers guide each student to success. 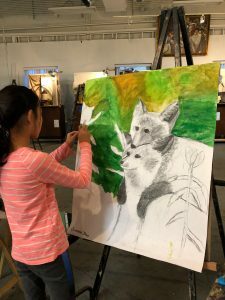 Students begin by drawing with charcoal on a large scale using a photo library of animals as their reference. 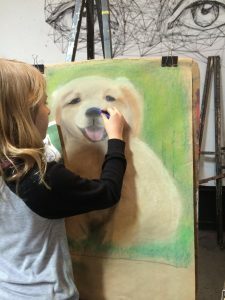 Through the layering of pastels, students learn color, value, composition and dimension. As a student develops, they are encouraged to draw from observation using the Studio’s still life. Sculpture is taught using a three dimensional reference. By building with and manipulating clay and adding texture, students will learn about lights, darks and proportion. Students progress to more advanced basics. They will learn to draw with deeper meaning, paint in oils and choose greater challenges in sculpture.